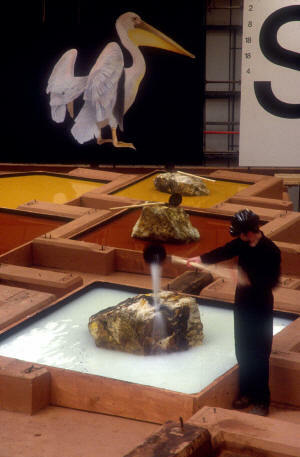 On 'Blood of the Pelican', installed at Geevor mine, 1997, as part of 'A Quality of Light': the first of three large-scale events organised by St Ives International. Firstly can you say something about your interests as an artist? There appear to have been themes already apparent in your work from the 70s that persisted, and were in some way brought together in the Geevor project, is that true? Yes, a body of interest has evolved and been explored over the years. Mostly the natural sciences, geological science, the meaning of and in matter - what could be called natural philosophy. Also place, process, the psychological meaning and understanding of place. That's how place is affected by man, and man by place, and the evolution of place and the processes at work in the making and meaning of place. I am also interested in the detail and the whole and how one reflects the other. I am fascinated by opposites hot/cold, wet/dry, black/white, open/closed. I also explore the conjunction of opposites and the edges and interface of this conjunction. I am interested in how people are effected by place and matter itself. Consequently I have for decades been interested in ancient sciences, early chemistry, the myths of creation and the art of alchemy. Regarding the work at Geevor, the interests are evident in the work but they are also evident in my other large scale installations. That said Geevor was uniquely suited to my practice both in a mythic sense and a practical, historic and industrial sense. Extracting ore from the earth can be seen as (is) a mythological process. 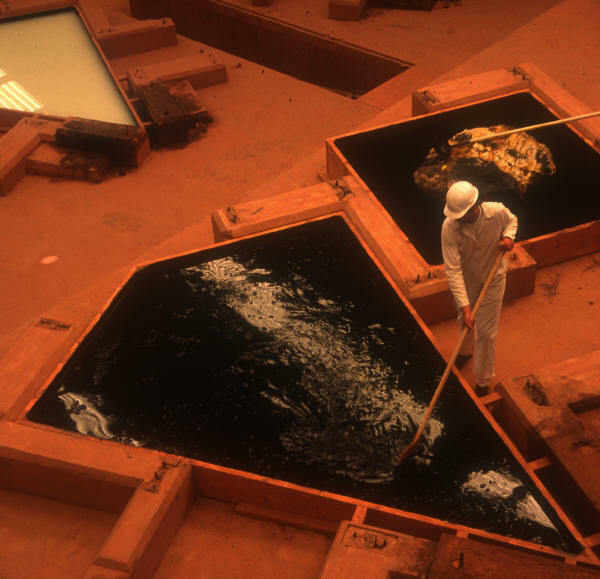 'Blood of the Pelican' was a large and ambitious project that took place in Geevor mine, which presumably had been unused for several years by 1997. Did the human figures in the pictures remain for the entire duration of the work? What were they doing? When I first went to Geevor some of the miners were still there, in fact they helped with the installation and preparation of the space as did art students from Falmouth. Geevor had only been recently closed. The scrap men had plundered the large room where my work was installed, they had removed all the newest steel shaking tables as scrap metal. The mined ore was separated from its matrix on shaking tables in photographs you can see the oil stains from the motors which drove these machines clearly visible on the pink tin ore covered concrete. The concrete shapes/blocks which made up the solid walls of the kite and square shaped tanks are the foundations of the shaking tables. I simply joined them up with timber to form solid walled tanks , the shape of the tanks comes from these foundations. The figures however are not miners, they are my 'workers'. Their job was to agitate the liquid in the tanks with large wooden spoons or paddles then anoint the huge blocks of mostly Quartz crystal with the liquid. We advertised and employed I think five people to work on this job. Unemployment was an issue in Cornwall and we decided to make this a real job with real pay. When not agitating the tanks, a process which took about an hour in total, one of the workers would act as a guide and answer questions about the work. They were superb and did a fantastic job. The area of the work was under quarries and mines health and safety regulations hence the hard hats etc. but they are as you can see polar opposites one is dressed in black the other white. They do also have symbolic purpose. Can you explain the symbolism of the coloured water, the Pelican and the letters 'Sr'? Is this something that was explained to visitors or was it left to their own interpretation? The liquids are not coloured water they are from back to front of the work - black (coal dust) - white (china clay) -red (tin ore) - yellow ( a local pottery clay) all in suspension, they settle out quickly the agitation reinvigorated the colour. BLACK, WHITE, RED, YELLOW. The colours have alchemical significance. All these elements also have significance either to Geevor Mine itself or to the local industries and culture of Cornwall, even referencing Bernard Leech. The pelican is a scanna-chrome print on canvas. The bird was drawn by an artist who gave me permission to use it. The pelican was originally drawn for the Collins Book of Birds. He stands 15 feet from head to foot in the print. The pelican is in Geevor, in fact in the museum of the mine ( Geevor is a heritage site). The pelican can be found on the tin stamp which identified where the tin originates. Geevor's trade mark logo was a lamb and flag. The flag has the form of a cross and this is an obvious Christian symbol. Historically in order to sell tin in non Christian countries another image/trade mark had to be used, they chose a less obviously Christian symbol: the pelican. The pelican is symbolic of self sacrifice for the good of others. The symbol is derived from the observation of the pelican regurgitating food for its young it does this by beating its breast with its beak. The medieval mind perceived this as an act of pecking its own breast and feeding its own blood to its offspring. The pelican in this context is an ancient symbol for tin. On the right Sn a contemporary scientific symbol for tin with related technical and elemental data hence the numbers. Most visitors saw the work after visiting the Geevor museum and readily associated the image of the pelican with Geevor tin. Did you get to see much of the rest of 'A Quality of Light', and do you remember much about it? Can you think of similar regional arts events that have successfully generated interest and press coverage because this remains an ongoing issue for us in Cornwall. I saw the whole show and met most of the artists a truly international group some very exciting work was produced. I have not really seen anything quite like 'Quality of Light 'Perhaps, in the UK , Trans-Penine and a few European sculpture exhibitions but nothing quite so specific to the locale. It was great to be involved in such a project. 'The best work in this show is by Glen Onwin - a marvellous installation in Geevor Tin Mine - which has only the most tangential connection with the subject of light. Even the artist sounds apologetic when he says it's about conceptual light; one must think of the miners emerging from the pit into daylight or night. In fact, Onwin's intervention refers to the methods of separating tin ore from crushed rock, using water and vibrating tables. A terraced installation of square and kite-shaped tanks (one black with coal, another white with china clay, the next red with oxide of tin ore, the last yellow with ochre), overlooked by a giant pelican, celebrates a mystical meeting of industry and alchemy. It's unusual and impressive'.